A farm worker has been charged with murdering a fellow Romanian whose body was found at a plant nursery. Tasin Sugaip, 45, died from multiple stab wounds to his chest, a post-mortem examination found. 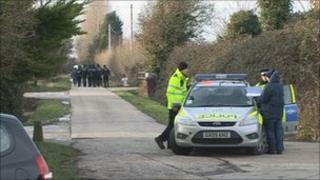 His body was discovered at a nursery in Batchmere, near Chichester, West Sussex, at 0020 GMT on Boxing Day, Sussex Police said. Gheorghe Badea, 53, of Second Avenue, Batchmere, is due at Chichester Magistrates' Court on Thursday. Mr Sugaip had been visiting the UK from his home in Tulcea, in the east of Romania. His wife and 19-year-old daughter have flown to help police inquiries and formally identify him.